The invention relates to a display having improved contrast ratio, switching performance, reflectivity at the Dmin state and structural integrity and methods for its manufacture. This application is a continuation-in-part of U.S. Ser. No. 09/874,391 filed on Jun. 4, 2001, the content of which is incorporated by reference in its entirety. As taught in the copending patent applications U.S. Ser. No. 09/518,488 filed on Mar. 3, 2000 (corresponding to WO 01/67170), U.S. Ser. No. 09/759,212 filed on Jan. 11, 2001 (corresponding to WO 02/56097); U.S. Ser. No. 09/606,654 filed on Jun. 28, 2000 (corresponding to WO 02/01280); U.S. Ser. No. 09/784,972 filed on Feb. 15, 2001 (corresponding to WO 02/65215); and U.S. Ser. No. 09/879,408 filed on Jun. 11, 2001, the sealing composition may be predispersed in the electrophoretic fluid, filled in the microcups to form a seamless sealing layer in a one-pass sealing process. In this case, the sealing composition may be in-line blended with the electrophoretic fluid immediately before the one pass filling and sealing process. The sealing composition may also be applied by the two-pass sealing method. FIGS. 2 a and 2 b show the “on” (Dmin) and “off” (Dmax) states, respectively, of a two-layer electrophoretic display. FIGS. 3 a and 3 b show a two-layer color electrophoretic display wherein the top layer comprises microcups filled with red, green and blue electrophoretic fluids and the bottom layer comprises microcups filled with a black electrophoretic fluid. FIGS. 4 a and 4 b show a two-layer full color electrophoretic display wherein the top layer comprises microcups filled with red, green and blue electrophoretic fluids and the bottom layer comprises microcups filled with red, green, blue and black electrophoretic fluid. The red, green, blue and inactive partition areas of the upper layer are overlapped with registration to the red, green, blue and black microcups of the lower layer, respectively. FIGS. 5 a and 5 b show the methods for the manufacture of an electrophoretic display having two or more layers of display cells. FIG. 5a shows a process of preparing a two-layer electrophoretic display by laminating two microcup layers with the sealing sides of the microcups facing each other. FIG. 5b shows another process of preparing a two-layer electrophoretic display by (i) transferring a microcup layer from a release substrate onto a second microcup layer on a conductor film and (ii) laminating the resultant composite film onto a conductor film, optionally with an adhesive. The process (i) may be repeated to prepare an electrophoretic display having more than two layers of display cells. FIGS. 6 a, 6 b, and 6 c show three alternative partition type cell structures. FIG. 6a is the groove type, 6 b is the groove type with substructure and 6 c is the grid type. Electrophoretic display cells prepared by the microcup technology, as shown in FIG. 1, comprise two electrode plates ( 10, 11), at least one of which is transparent (10), and a layer of cells (12) enclosed between the two electrodes. The cells are filled with charged pigment or pigment-containing particles dispersed in a colored dielectric solvent and sealed with a sealing layer (13). Not shown in FIG. 1, the sealing layer preferably extends over the partition walls (16) and forms a contiguous layer thereon. The sealed cells are laminated onto the second conductor film (10) optionally with an adhesive layer (14). When a voltage difference is imposed between the two electrodes, the charged particles migrate to one side, such that either the color of the pigment or the color of the solvent is seen through the transparent conductor plate or film (10). In addition, at least one of the two conductor films is patterned. To improve the contrast ratio of the EPD, one of two approaches is typically taken: (a) using microcups of a higher payload (a higher aspect ratio and/or a higher ratio of opening area to total area) or (b) using a blackened conductor film (11) on the non-viewing side. Since no light scattering particles are present in the inactive partition areas (16), the viewer will see the background color through the partition areas in both the “on” and “off” states. The blackened background of such a single layer EPD results in a higher Dmax and contrast ratio, but a lower reflectivity in the Dmin state. The trade-off between contrast ratio and reflectivity in the Dmin state is eliminated in the staggered two-layer structure depicted in FIGS. 2 a and 2 b. In the two figures, the display has an upper cell layer (21) and a lower cell layer (22). The cells of the two layers are individually sealed with a sealing layer (23). The two layers are arranged in a staggered fashion and the sealing sides of the two layers face each other. The two-layer structure is sandwiched between a top transparent conductor film (24) and a bottom conductor film (25). In the “on” state (FIG. 2 a), the white particles in both upper and lower layers are attracted to the top of the cells (toward the viewing side). The partition areas (26) of the top layer will appear “white” since light is reflected back by the particles in the lower layer. In contrast, at the “off” state (FIG. 2b), the white particles in both layers are attracted to the bottom of the cells (toward the non-viewing side). The partition areas of the top layer will appear “colored” since light is absorbed by the colored dielectric solvent in the lower layer. As a result, Dmax and contrast ratio of the display may be improved without the trade-off in the reflectivity in the Dmin state. FIGS. 3 a and 3 b show a two-layer color electrophoretic display wherein the top layer (31) comprises display cells filled with red, green and blue electrophoretic fluids and the bottom layer (32) comprises display cells filled with a black electrophoretic fluid. In both figures, the inactive partition areas (36) of the upper layer (31) are staggered with the active cell areas of the lower layer (32). The two-layer structure is sandwiched between two conductor films (34) and (35). At least one of the two conductor films is transparent. FIGS. 4 a and 4 b show a two-layer full-color electrophoretic display wherein the top layer (41) comprises display cells filled with red, green and blue electrophoretic fluids and the bottom layer (42) comprises display cells filled with red, green, blue and black electrophoretic fluids. The colored cells and the inactive partition areas (46) of the two layers are arranged in a staggered manner so that the red, green, blue and inactive partition areas of the top layer (41) are overlapped with registration to the red, green, blue and black microcups of the bottom layer (42), respectively. The two layer structure is sandwiched between two conductor films (44) and (45). At least one of the two conductor films is transparent. For reflective electrophoretic displays, the dimension of each individual microcup may be in the range of about 10 2 to about 106 μm2, preferably about 103 to about 105 μm2. The depth of the microcups may be in the range of about 3 to about 200 μm, preferably about 10 to about 50 μm. The ratio of opening area to total area may be in the range of about 0.1 to about 0.95, preferably about 0.4 to about 0.90. The width of the partition between microcups may be in the range of about 2 to about 200 μm, preferably about 5 to about 20 μm. In the case of groove or channel type of display cells as shown in FIG. 6 a and 6 b, the length of the groove may be in the range of about 10 μm to about 90 inches, preferably in the range of about 60 μm to about 40 inches. The width of the groove or channel opening may be in the range of about 10 to about 500 μm, preferably in the range of about 40 to about 200 μm. The width of the groove or channel partition wall may be in the range of about 2 to about 500 μm, preferably about 5 to about 50 μm. For the groove type cells, an edge seal adhesive may be applied to the first block at both ends (in the longitudinal direction) of the grooves. The groove type cells are also useful for multicolor applications. In the case of the grid type of display cells as shown in FIG. 6 c, the length and width of the grid opening may be in the range of about 10 to about 300 μm, preferably in the range of about 40 to about 100 μm. The width of the grid partition wall may be in the range of about 2 to about 500 μm, preferably about 5 to about 50 μm. Suitable solvents include alkanes (including C 6-12 alkanes such as heptane, octane or Isopar solvents from Exxon Chemical Company, nonane, decane or their isomers), cycloalkanes (including C6-12 cycloalkanes such as cyclohexane and decalin or the like), alkylbezenes (including mono- or di-C1-6 alkyl benzenes such as toluene, xylene or the like), alkyl esters (including C2-5 alkyl esters such as ethyl acetate, propyl acetate, isobutyl acetate or the like), ketones (including C3-7 ketones such as methyl ethyl ketone, methyl propyl ketone, methyl butyl ketone, cyclohexanone or the like) or C3-5 alkyl alcohols (including isopropanol, butanol or the like). Mixtures of an alkylbenzene and an alkane are useful for hydrocarbon elastomers. FIGS. 5 a and 5 b show the methods for the manufacture of an electrophoretic display having two or more layers of display cells. FIG. 5 a shows the process of preparing a two-layer electrophoretic display by laminating a top layer (51) and a bottom layer (52) of display cells prepared by, for example, the procedure described in the steps 1-4 in Section V. The filled display cells are individually sealed with a sealing layer (53). The sealing layer is formed from a composition as described in Section IV above. The conductor film (54) on the viewing side is transparent and the conductor film (55) on the non-viewing side may be blackened or colored. An adhesive layer may be used to facilitate the lamination process. The two layers (51 and 52) are arranged with the inactive partition areas (56) of one layer and the active cell areas of another layer in a staggered fashion. FIG. 5 b shows another process of preparing a two layer electrophoretic display by (i) preparing a layer of display cells (52) on a conductor film (55) by, for example, the procedure described in the steps 1-4 in Section V; (ii) preparing another layer of display cells (51) on a release substrate (57) by the same procedure in (i); (iii) laminating the layer of display cells (51) on the release substrate (57) onto the layer (52), optionally with an adhesive (not shown); (iv) removing the release substrate and (v) laminating the resultant composite film onto a conductor film (54), optionally with an adhesive (not shown). The steps (ii), (iii), and (iv) may be repeated to prepare an electrophoretic display having more than two layers of display cells. In the two-layer or multilayer electrophoretic display as prepared above, it is important that the inactive-partition areas of the upper microcup layer are arranged with the active microcup areas of the lower layer in a staggered manner. At least one of the two conductor films ( 54 and 55) is pre-patterned. Also at least the conductor film (54) on the viewing side is transparent. A primer solution comprising of 5 parts of Ebecryl 830, 2.6 parts of SR-399 (from Sartomer), 1.8 parts of Ebecry 1701, 1 part of PMMA (Mw=350,000 from Aldrich), 0.5 parts of Irgacure 500 and 40 parts of methyl ethyl ketone (MEK) was coated onto a 2 mil 60 ohm/sq. ITO/PET film (from Sheldahl Inc., MN.) using a #3 Myrad bar, dried and UV cured by using the Zeta 7410 (5 w/cm 2, from Loctite) exposure unit for 15 minutes in air. The microcup formulation prepared in Example 1 was coated onto the treated ITO/PET film with a targeted thickness of about 50 μm, embossed with a Ni—Co male mold having a 60 (length)×60 (width) μm repetitive protrusion square pattern with 25-50 μm protrusion height and 10 μm wide partition lines, UV cured from the PET side for 20 seconds and removed from the mold with a 2″ peeling bar at a speed of about 4-5 ft/min. Well-defined microcups with depth ranging from 25 to 50 μm were prepared by using male molds having corresponding protrusion heights. Microcup arrays of various dimension such as 70 (length)×70 (width)×35 (depth)×10 (partition), 100 (L)×100 (W)×35(D)×10 (P), and 100 (L)×100(W)×30(D)×10(P) μm were also prepared by the same procedure. The procedure of Example 3 was followed, except that the Ti Pure R706 and Fluorolink were replaced by a polymer coated TiO 2 particles PC-9003 from Elimentis (Highstown, N.J.) and Krytox (Du Pont), respectively. 17.8 Gm of Krytox® methyl ester (DuPont, 17.8 g, MW=about ˜1780, g=about 10, DuPont) was dissolved in a solvent mixture containing 12 gm of 1,1,2-trichlorotrifluoroethane (Aldrich) and 1.5 gm of α,α,α-trifluorotoluene (Aldrich). 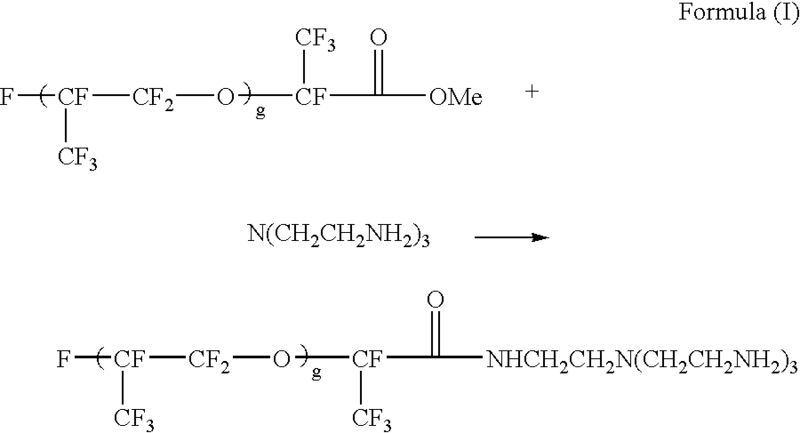 The resultant solution was added drop by drop into a solution containing 7.3 gm of tris(2-aminoethyl)amine (Aldrich) in 25 gm of α,α,α-trifluorotoluene and 30 gm of 1,1,2-trichlorotrifluoroethane over 2 hours with stirring at room temperature. The mixture was then stirred for another 8 hours to allow the reaction to complete. The IR spectrum of the crude product clearly indicated the disappearance of C═O vibration for methyl ester at 1780 cm −1 and the appearance of C═O vibration for the amide product at 1695 cm−1. Solvents were removed by rotary evaporation followed by vacuum stripping at 100° C. for 4-6 hours. The crude product was then dissolved in 50 ml of PFS2 solvent (low m.w. perfluoropolyether from Ausimont) and extracted with 20 ml of ethyl acetate three times, then dried to yield 17 gm of purified product (Rf-amine1900) which showed excellent solubility in HT200. The product (Rf-amine1780) showed good solubility in HT200. Other reactive multifunctional R f-amines of Formula (I) having different molecular weights such as Rf-amine4900 (g=about 30), Rf-amine2000 (g=about 11), Rf-amine800 (g=about 4) and Rf-amine650 (g=about 3) were also synthesized according to the same procedure. 9.05 Gm of Desmodur® N3400 aliphatic polyisocyanate (from Bayer AG) and 0.49 gm of triethanolamine (99%, Dow) were dissolved in 3.79 gm of MEK. To the resultant solution, 13 gm of TiO 2 R706 (DuPont) was added and homogenized for 2 minutes with a rotor-stator homogenizer (IKA ULTRA-TURRAX T25, IKA WORKS) at ambient temperature. A solution containing 1.67 gm of 1,5-pentanediol (BASF), 1.35 gm of polypropylene oxide (m.w.=725, from Aldrich), 2.47 gm of MEK and 0.32 gm of a 2% dibutyltin dilaurate (Aldrich) solution in MEK was added and further homogenized for 2 minutes. In the final step, 0.9 gm of Rf-amine 4900 prepared from Preparation 1 in 40.0 gm of HT-200 (Ausimont) was added and homogenized for 2 minutes, followed by addition of additional 0.9 gm of Rf-amine 4900 in 33.0 gm of HT-200 and homogenization for 2 minutes. A low viscosity microcapsule dispersion was obtained. 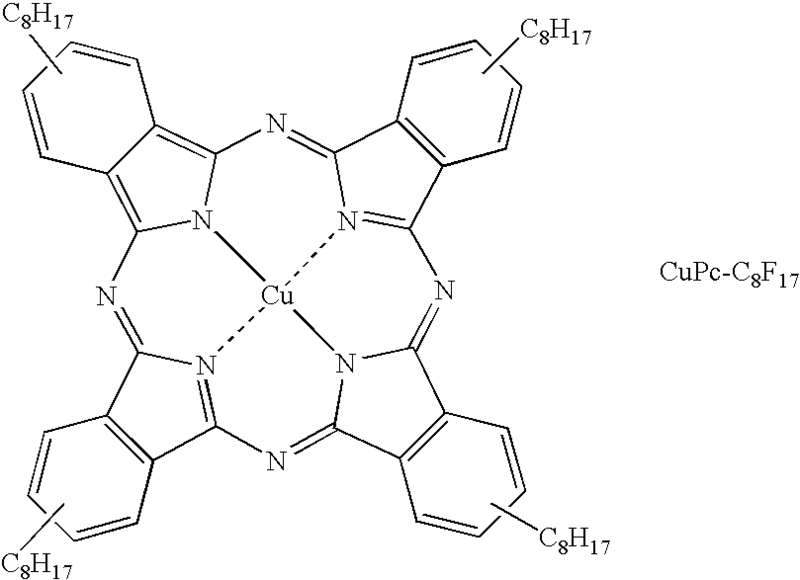 An EPD fluid containing 1.0 wt % by weight of CuPc-C 8F17 (structure given below) and various amount of the resultant TiO2-containing microcapsule dispersion in HT-200 was filled into the microcups which were then sealed and sandwiched between two ITO/PET films according to the procedure described in Preparation 3. A primer coating solution containing 33.2 gm of EB 600™ (UCB, Smyrna, Ga.), 16.12 gm of SR 399™ (Sartomer, Exton, Pa.), 16.12 gm of TMPTA (UCB, Smyrna, Ga.), 20.61 gm of HDODA (UCB, Smyrna, Ga.), 2 gm of Irgacure™ 369 (Ciba, Tarrytown, N.Y.), 0.1 gm of Irganox™ 1035 (Ciba), 44.35 gm of poly(ethyl methacrylate) (MW. 515,000, Aldrich, Milwaukee, Wis.) and 399.15 gm of MEK (methyl ethyl ketone) was mixed thoroughly and coated onto a 5 mil transparent conductor film (ITO/PET film, 5 mil OC50 from CPFilms, Martinsville, Va.) using a #4 drawdown bar. The coated ITO film was dried in an oven at 65° C. for 10 minutes and exposed to 1.8 J/cm 2 of UV light under nitrogen using a UV conveyer (DDU, Los Angles, Calif.). The microcup composition was slowly coated onto a 4″×4″ electroformed Ni male mold for an array of 100 μm (length)×100 μm (width)×25 μm (depth)×15 μm (width of top surface of the partition wall between cups) microcups. A plastic blade was used to remove excess of fluid and gently squeeze it into “valleys” of the Ni mold. The coated Ni mold was heated in an oven at 65° C. for 5 minutes and laminated with the primer coated ITO/PET film prepared in Preparation 3A, with the primer layer facing the Ni mold using a GBC Eagle 35 laminator (GBC, Northbrook, Ill.) preset at a roller temperature of 100° C., lamination speed of 1 ft/min and the roll gap at “heavy gauge”. A UV curing station with a UV intensity of 2.5 mJ/cm 2 was used to cure the panel for 5 seconds. The ITO/PET film was then peeled away from the Ni mold at a peeling angle of about 30 degree to give a 4″×4″ microcup array on ITO/PET. An acceptable release of the microcup array from the mold was observed. The thus obtained microcup array was further post-cured with a UV conveyor curing system (DDU, Los Angles, Calif.) with a UV dosage of 1.7 J/cm2. An electrophoretic fluid containing 9.7% by weight (dry weight) of the TiO 2-containing microcapsules prepared according to the Preparation 2, 1.0% by weight of CuPc-C8F17 and 0.5% by weight of Rf-amine2000 (based on the total dry weight of the TiO2-containing microcapsule) prepared according to Preparation 1 in HT-200 was filled into the 4″×4″ microcup array prepared from Preparation 3B using a #0 drawdown bar. The excess of fluid was scraped away by a rubber blade. An electrophoretic fluid containing 6.0% by weight (dry weight) of the TiO 2-containing microcapsules prepared according to Preparation 2, 1.0 wt % by weight of CuPc-C8F17 and 0.5% by weight (based on the total dry weight of the TiO2-containing microparticles) of Rf-amine2000 (from Preparation 1) in HT200 was filled and sealed into a microcup array prepared in Preparation 3C (the lower layer). The sealed microcup layer was laminated to a second sealed microcup layer (the upper layer) prepared in the Comparative Example 15 to form a staggered two-layer EPD film in which the inactive partition areas of the upper microcup layer were arranged in a staggered manner with registration to the active microcup areas of the lower layer. The resultant two-layer EPD film was evaluated as in the Comparative Example 15. The contrast ratio and Dmin at various normalized field strength measured from the upper layer side are also summarized in Table 3. The same procedure of Example 16 was followed except that the upper microcup layer was filled with an electrophoretic fluid containing 9.7% by weight (dry weight) of TiO 2-containing microparticles from Preparation 2, 1.0% by weight of CuPc-C8F17 and 0.5% by weight (based upon the total dry weight of the TiO2-containing microparticles) of Rf-amine2000 in HT200; and the lower microcup layer was filled with 9.7% by weight of the TiO2-containing microparticles, 1.5% by weight of CuPc-C8F17 and 0.5% by weight (based upon the total dry weight of the TiO2-containg microparticles) of Rf-amine 2000 in HT200. The contrast ratio and Dmin at various normalized field strength are summarized in Table 3. The contrast ratio and Dmin were shown to have been further improved by the increases in dye and particle concentrations in the lower layer. The same procedure of Example 16 was followed, except that the electrophoretic fluid of the upper microcup layer contained 9.7% by weight of the TiO 2-containing microparticles from Preparation 2, 0.7% by weight of CuPc-C8F17 and 0.5% by weight (based upon the total dry weight of the TiO2-containg microparticles) of Rf-amine2000 in HT200; and the lower microcup layer contained 9.7% by weight of the TiO2-containing microparticles, 1.5% by weight of CuPc-C8F17 and 0.5% by weight (based upon the total dry weight of the TiO2-containg microparticles) of Rf-amine2000 in HT200. The contrast ratio and Dmin at various normalized field strength are summarized in Table 3. While the present invention has been described with reference to the specific embodiments thereof, it should be understood by those skilled in the art that various changes may be made and equivalents may be substituted without departing from the true spirit and scope of the invention. In addition, many modifications may be made to adapt a particular situation, materials, compositions, processes, process step or steps, to the objective, spirit and scope of the present invention. All such modifications are intended to be within the scope of the claims appended hereto. For example, it should be noted that the method of the invention for preparing microcups may also be used for preparing microcups for liquid crystal displays. Similarly, the microcup selective filling, sealing and ITO laminating methods of the invention may also be employed in the manufacture of liquid crystal displays. Moreover, both the one-pass and two-pass sealing and filling processes and compositions are also useful to fill and seal electrophoretic displays having the groove type, the grid type as shown in FIGS. 6 a, 6 b and 6 c and other partition type of cell structures. 2. The display of claim 1 wherein said solvent has a specific gravity no greater than that of the display fluid. 3. The display of claim 1 wherein said thermoplastic elastomer has a specific gravity no greater than that of the display fluid. 4. The display of claim 1 wherein said solvent or solvent mixture has a surface tension of lower than 40 dyne/cm. 5. The display of claim 1 wherein said solvent or solvent mixture has a surface tension of lower than 35 dyne/cm. 6. The display of claim 1 wherein said solvent or solvent mixture is selected from a group consisting of alkanes, cyclic alkanes, alkylbenzenes, alkyl esters, ketones and alkyl alcohols. 7. The display of claim 6 wherein said solvent is heptane, octane, nonane, cyclohexane, decalin, toluene, xylene and their isomers or mixtures thereof. 9. The display of claim 8 wherein n is 1-10. 10. The display of claim 8 wherein said thermoplastic elastomer is poly(styrene-b-butadiene), (poly(styrene-b-butadiene-b-styrene), poly(styrene-b-isoprene-b-styrene), poly(styrene-b-ethylene/butylenes-b-styrene), poly(styrene-b-dimethylsiloxane-b-styrene), poly(α-methylstyrene-b-isoprene), poly(α-methylstyrene-b-isoprene-b-α-methylstyrene), poly(α-methylstyrene-b-propylene sulfide-b-α-methylstyrene), poly(α-methylstyrene-b-dimethylsiloxane-b-α-methylstyrene) or their grafted co-polymers and derivatives thereof. 11. The display of claim 1 wherein the thermoplastic elastomer is polyester polyurethane, polyether polyurethane, polybutadiene polyurethane, polysiloxane polyurethane, poly(ethylene-co-propylene-co-5-methylene-2-norbornene), (ethylene-propylene-diene terpolymer) or their grafted co-polymers and derivatives thereof. 12. The display of claim 1 wherein said sealing composition further comprises a thermoplastic material that is compatible with one of the blocks of the thermoplastic elastomer. 13. The display of claim 12 wherein the thermoplastic material is selected from the group consisting of polystyrene and poly (α-methylstyrene). 14. The display of claim 1 wherein said composition further comprises a wetting agent. 15. The display of claim 14 wherein said wetting agent is selected from a group consisting of surfactants, ZONYL fluorosurfactants, fluoroacrylates, fluoromethacrylates, fluoro-substituted long chain alcohols, perfluoro-substituted long chain carboxylic acids, SILWET silicone surfactants and their derivatives. 16. The display of claim 1 wherein said composition further comprising one or more of the following agents: a crosslinking agent, a vulcanizer, a multifunctional monomer or oligomer, a thermal initiator or a photoinitiator. 17. The display of claim 16 wherein said crosslinking agent is a bisazide and said vulcanizer is a disulfide. 18. The display of claim 17 wherein said bisazide is 4,4′-diazidodiphenylmethane or 2,6-di-(4′-azidobenzal)-4-methylcyclohexanone). 19. The display of claim 17 wherein said disulfide is 2-benzothiazolyl disulfide or tetramethylthiuram disulfide. 20. The display of claim 1 wherein said display fluid is an electrophoretic display fluid. 21. The display of claim 1 wherein said display fluid comprises a liquid crystal. b) laminating one of the layers over the other optionally with an adhesive layer. 23. The process of claim 22 wherein step (b) is carried out by laminating one layer of the display cells over the other display panel with the sealing sides of the two layers facing each other. f) laminating a second conductor plate or film over the topmost layer of said stack. 25. The process of claim 24 wherein step (c) is carried out by laminating said second layer over said first layer with the sealing sides of the two layers facing each other, followed by removing said transfer release layer. 26. The process of claim 24 wherein step (e) is carried out by laminating said additional layers over the top layer in said stack of layers already formed, with the sealing sides of the additional layers facing the layers underneath, followed by removing said transfer release layers. 27. The process of claim 24 wherein step (f) is carried out by lamination with or without an adhesive layer. 28. The process of claim 22 or 24 wherein said solvent or solvent mixture has a specific gravity no greater than that of the display fluid. 29. The process of claim 22 or 24 wherein said thermoplastic elastomer has a specific gravity no greater than that of the display fluid. 30. The process of claim 22 or 24 wherein said cells are prepared by microembossing. 31. The process of claim 22 or 24 wherein said cells are prepared by photolithography or pre-punched holes. 32. The process of claim 22 or 24 wherein display cells of different layers are prepared by different methods. 33. The process of claim 32 wherein said methods are microembossing, photolithography or pre-punched holes. 34. The process of claim 22 or 24 wherein said sealing step further comprises exposing the sealing layer to UV radiation or thermal baking. 35. The process of claim 22 or 24 wherein said solvent or solvent mixture in the sealing composition has a surface tension of lower than 40 dyne/cm. 36. The process of claim 22 or 24 wherein said solvent or solvent mixture has a surface tension of lower than 35 dyne/cm. 37. The process of claim 22 or 24 wherein said solvent or solvent mixture is selected from a group consisting of alkanes, cyclic alkanes, alkylbenzenes, alkyl esters, ketones and alkyl alcohols. 38. The process of claim 37 wherein said solvent is heptane, octane, nonane, cyclohexane, decalin, toluene, xylene and their isomers or mixtures thereof. 40. The process of claim 39 wherein n is 1-10. 41. The process of claim 22 or 24 wherein said thermoplastic elastomer is poly(styrene-b-butadiene), (poly(styrene-b-butadiene-b-styrene), poly(styrene-b-isoprene-b-styrene), poly(styrene-b-ethylene/butylenes-b-styrene), poly(styrene-b-dimethylsiloxane-b-styrene), poly(α-methylstyrene-b-isoprene), poly(α-methylstyrene-b-isoprene-b-α-methylstyrene), poly(α-methylstyrene-b-propylene sulfide-b-α-methylstyrene), poly(α-methylstyrene-b-dimethylsiloxane-b-α-methylstyrene), and their grafted co-polymers and derivatives thereof. 42. The process of claim 22 or 24 wherein the thermoplastic elastomer is polyester polyurethane, polyether polyurethane, polybutadiene polyurethane, polysiloxane polyurethane, poly(ethylene-co-propylene-co-5-methylene-2-norbornene), (ethylene-propylene-diene terpolymer) or their grafted co-polymers and derivatives thereof. 43. The process of claim 22 or 24 wherein said sealing composition further comprises a thermoplastic material that is compatible with one of the blocks of the thermoplastic elastomer. 44. The process of claim 43 wherein the thermoplastic material is selected from the group consisting of polystyrene and poly (α-methylstyrene). 45. The process of claim 20 or 24 wherein said sealing composition further comprises a wetting agent. 46. The process of claim 45 wherein said wetting agent is selected from a group consisting of surfactants, ZONYL fluorosurfactants, fluoroacrylates, fluoromethacrylates, fluoro-substituted long chain alcohols, perfluoro-substituted long chain carboxylic acids, SILWET silicone surfactants and their derivatives. 47. The process of claim 22 or 24 wherein said sealing composition further comprising one or more of the following agents: a crosslinking agent, a vulcanizer, a multifunctional monomer or oligomer, a thermal initiator or a photoinitiator. 48. The process of claim 47 wherein said crosslinking agent is a bisazide and said vulcanizer is a disulfide. 49. The display of claim 1 wherein said display cell is of the groove or channel type. 50. The display of claim 49 wherein the groove or channel type cell has a length in the range of about 10 μm to about 90 inches, a width of the groove or channel opening in the range of about 10 to about 500 μm and a width of the groove or channel partition wall in the range of about 2 to about 500 μm. 51. The display of claim 49 wherein the groove or channel type cell has a length in the range of about 60 μm to about 40 inches, a width of the groove opening in the range of about 40 to about 200 μm and a width of the groove partition wall in the range of from about 5 to about 50 μm. 52. The display of claim 1 wherein said display cell is of the grid type. 53. The display of claim 52 wherein said grid type cell has a length and a width of the grid opening in the range of about 10 to about 300 μm and a width of the partition wall in the range of about 2 to about 500 μm. 54. The display of claim 52 wherein said grid type cell has a length and a width of the grid opening in the range of about 40 to about 100 μm and a width of the partition wall in the range of about 5 to about 50 μm. US879408A (en) * 1907-09-09 1908-02-18 Christopher W Owens Duplex gravity gate-latch.